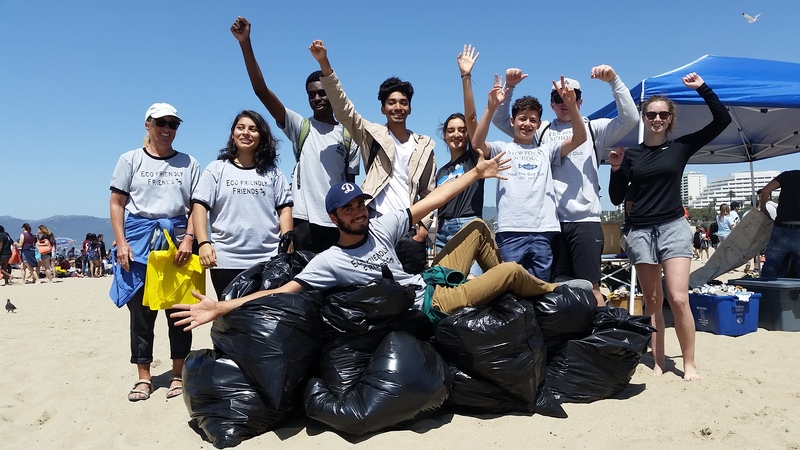 On February 17th, the PVHS Chapter of Heal the Bay went out to clean up Torrance Beach. It was a clear day, and we had a great turn-out. We started around 10:00, and the event ran for about two hours. The groups, dispatched in pairs and trios, found a lot of small plastic pieces and cigarette buds. Groups also found interesting objects, including diapers, syringes, and band aids. After about two hours of trash pick-up, we were able to collect about 500 pieces of Styrofoam and 230 pieces of plastic, along with other large numbers of different trash. Most of the trash was found along the bike paths, where many people walk, run, and bike daily. My name is Halina Do-Linh and I am the new Programs Coordinator for Heal the Bay. I will be working together with Club Heal the Bay partners, as well as coordinating other beach programs that we run at Heal the Bay including Suits on the Sands and Nothin’ But Sand Cleanups. I haven’t been here long, but from looking at past Youth Summits and your previous Club Heal the Bay events/projects I can see there is a so much dedication, enthusiasm, and creativity that comes from the young adults (you!) in the Greater Los Angeles area. Because of that I am so excited to be working with each and every one of you to achieve your club goals, plan events and activities, and to recognize all that you have done to help the environment. Here is a little bit about myself and my journey to Heal the Bay. I am someone who grew up on camping trips, hikes, and endless explorations of all the different kinds of ecosystems that California hosts. I was lucky to have those experiences because it ignited a passion that led me to participate in beach cleanups (ones like Heal the Bay hosts), to intern at the Moorpark College Zoo, and ultimately to complete my bachelor’s degree in Environmental Studies and Biology at the University of California, Santa Cruz. After university, I went on to travel and explore other environments for either work or personal. I saw glaciers in Patagonia, Bristlecone Pines in the Eastern Sierras, Whale Sharks in Southern Baja California, Ringtail cats in the Mojave Desert, and so much more. I was an outdoor educator teaching primarily middle school students, and after that I was coordinating a UC-wide field course working with undergrads. By the end of 2017 though I was drawn back home to Los Angeles where I spent most of my childhood– where my passion for the environment first began. I am incredibly happy to be part of Heal the Bay where I can extend my fascination and concerns about the environment to young adults like you and everyone else. In my free time, you can find me with my head in the tide pools or up in the Santa Monica Mountains. One of my favorite local hikes is Sandstone Peak, which is the highest peak in the Santa Monica Mountains! I can’t wait to connect with all of you who are part of Club Heal the Bay. Our group of 18 Mark Keppel High School Heal the Bay members were involved in cleaning the Ballona creek along the Playa del Rey on the morning of October 21st, 2017. Our members arrived very early in the morning at the location provided for the creek clean up. We were able to help carry the boxes and tables to assist the set up of the morning clean up event. We listened to the instruction and direction for the clean up and split up into groups of 3-4 members set out to clean the edge of the creek. At the end of around 2 hours clean up, the group of volunteers were able to collect up to 25 pounds of trash from the area. This was our first Heal the Bay beach cleanup event and all members had pleasing day cleaning up the creek. Some of us got our shoes wet as we tried too hard to collect the trash floating inside the creek. The uneven rocks around the creek made it fun to walk on. It felt more like a school field trip as members chatted among themselves as they collected the litter. As a club, we have learned the effects of the trash we see in the streets of LA and the path it gets to the ocean. We’ve also learned the importance of safely disposing of our trash and taking care of our environment if we wanted to enjoy the beauty of nature. After the event, all members felt satisfied at our work and agreed that this event was a good way to spend the day. This cleanup allowed us to make new friends and create new memories with our own friends. We had enjoyed the view while cleaning the trash and can’t wait until the next cleanup we participate in! Nature’s Own Club organized an awesome Earth Day celebration at Luskin Academy. Earth Day is a significant day because it’s one where people bring awareness to the many environmental issues around the world. Nature’s Own Club celebrated this special day because they knew how much it would help Luskin Academy become eco-friendlier. The Earth Day Celebration at Luskin Academy consisted of many hands-on activities. The members of Nature’s Own were in charge of managing everything – they even created games for the students. Activities included “Trash Dash” and edible terrarium models. Students painting pots and planters. “Trash Dash” is a game where students have a minute to sort as much trash as possible. The contestant with the most trash sorted at the end received a prize. Students learned about the necessity of a clean environment and that they could have fun while doing it. Another activity was an edible terrarium model which was made out of crushed Oreos, pudding, edible grass and chocolate rocks. Many of the students wanted to make actual terrariums because of how beautiful they looked. Some of the students created art out of trash, such as pigs and dragons. This is another way to recycle – it shows how you can reuse anything or even use it as decorations. At the end of the day, students were given the chance to participate in a raffle for a Venus flytrap. As people participated at the event they had huge smiles and laughed. It is safe to say that Earth Day at Luskin Academy was a success. Face painting was another huge hit. students that are members of the club. 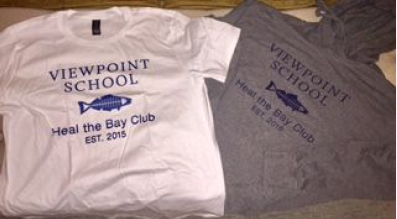 The t-shirts and hoodies that were sold during the fundraiser. He worked with his school’s administrative team and his club sponsor to approve the designs on the clothes, and he set up an online store with a local vendor for the students to purchase for themselves T-shirts, and or hoodies for them to wear at the cleanups throughout the year. Each clothing item had an additional two dollars built into the price above the actual cost to act as a fundraising effort for Heal the Bay once the sale was over. The students were given 3 weeks in total to order shirts and hoodies from the online store, and once the orders were all completed and distributed the vendor sent a check to Heal the Bay for a grand total of $46.85. donate money to the amazing organization that is Heal the Bay.